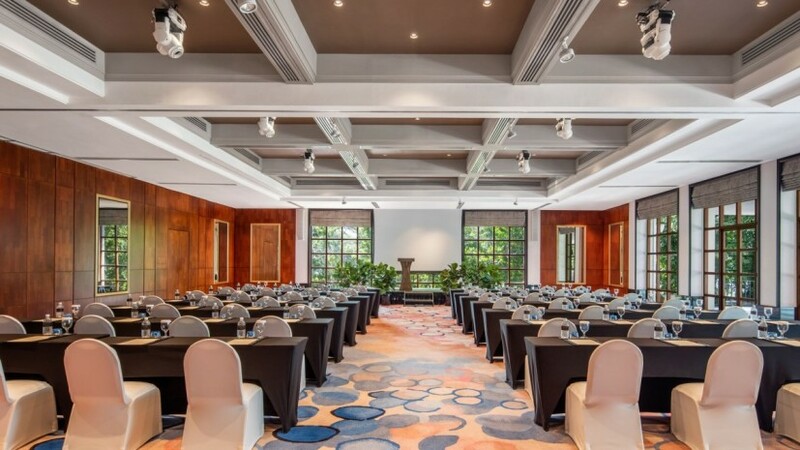 Our most spacious events venue, the Straits Ballroom is ideal for larger celebrations and meetings. Nature invites itself in through generous glass doors and windows that let in natural daylight and views of the manicured garden. Just outside is the wide Straits Veranda – with a capacity for 150 people and breathtaking views of tropical woodlands and the South China Sea beyond. Two wide doors open directly onto the Celebrations & Events Centre’s light-filled lobby, featuring contemporary artwork, a vibrant color palette and even more inspiring views of the outdoors. The ballroom is large enough to accommodate 320 guests in a cocktail format, and 250 for sit-down banquets. This flexible space can also be divided into two smaller function rooms, Straits I and Straits II.